This is shaping up to be one of the longest projects I have ever worked on! Although it’s very rewarding, it’s also extremely frustrating seeing as I usually like to get things over and done with pretty quickly. Plus, there’s that very un-fun arm pain that comes along with it. 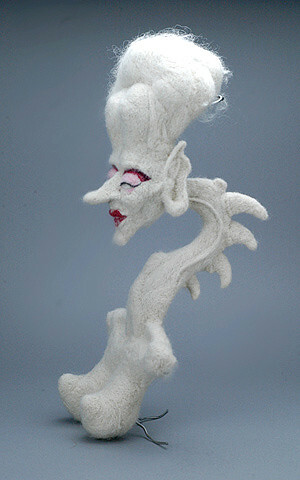 Needle felting is pretty unpredictable as a medium — the sculpture keeps changing my original design slightly with each session. And I’m still only a litte over halfway done! 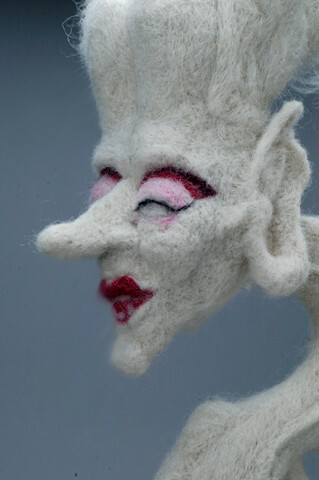 For my next piece I’m pretty sure I will do part clay and part needle felting to save me some time and bouts of manic hair pulling (aka Trichotillomania). This entry was posted on April 17, 2011 by croshame. It was filed under Needle Felting . Oh but it looks very good!! Wow, this is amazing!I just found your site thru ravelry…off to look some more. Wow wow wow. How much more do you have to go? What are your plans for this? Are her limbs going to grow or is the rest of it detail work? 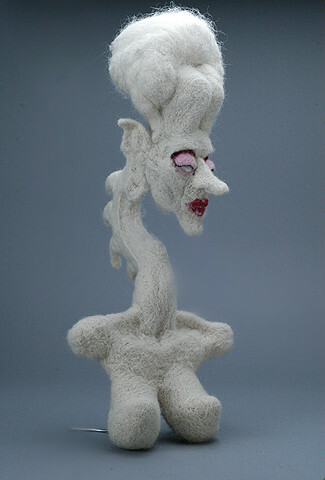 Admittedly, I had to look up needle felting this morning, but my understanding is you have to felt *into* some base material – what did this look like before actual felting began? I was going to say that I hoped your plans included showing it. One of my local galleries has an annual juried exhibit with prizes that is open to all gallery members, but something with longer-term display would be even better. And I understand decent hourly wage being impossible to get – pretty much anything I do with fancy embroidery is that way (though probably not to this degree). Awesome!! Such fantastic structure to her face! !